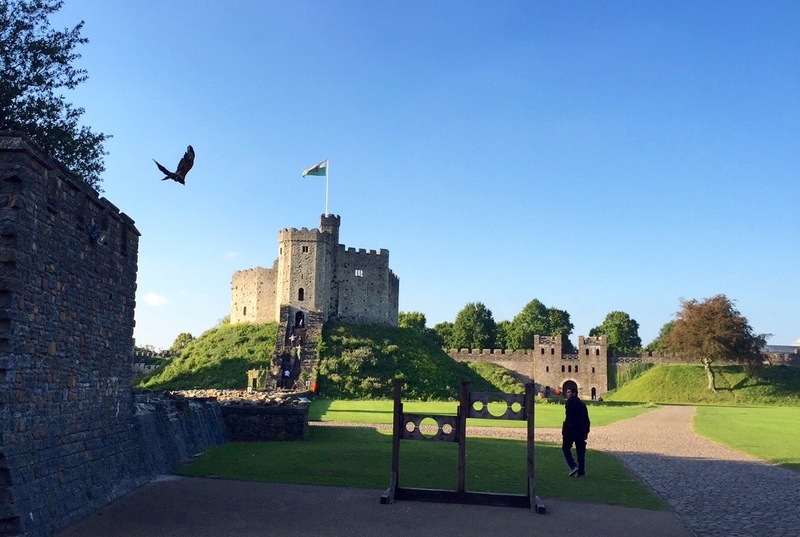 On the grounds of Cardiff Castle, a falconer trains his bird. The castle keep looms in the background. Once again, I’m playing a bit of catch-up in the wake of travels and, mostly, a nasty cold/fever that kept me down and out for most of three days. Not a recommended vacation pastime. So let us return to Cardiff for a moment before moving on to other random observations. 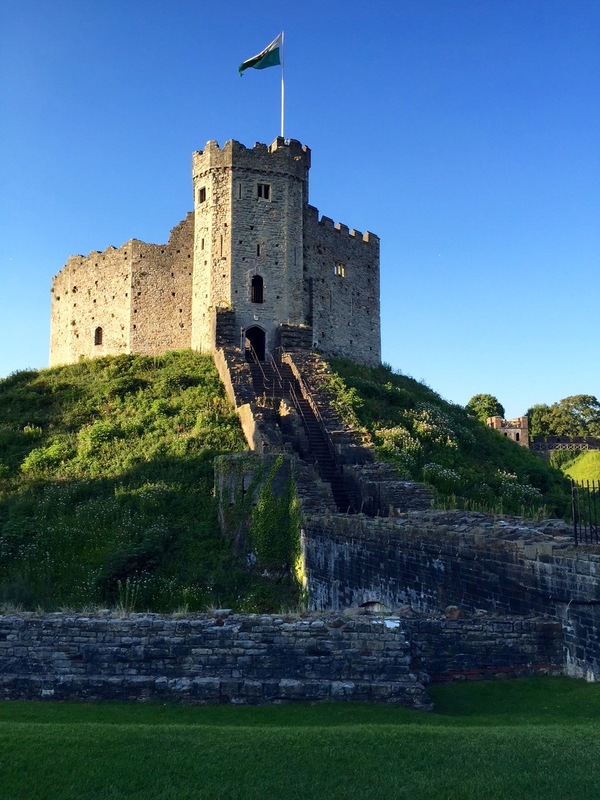 While the men did play (well, watch the play on the rugby pitch), Tina Carpenter and I had a chance to slip behind the tall outer walls of Cardiff Castle — which doesn’t look like all that much from the outside, except for the giant rugby ball now appearing to burst through it. I assume that will vanish with the end of the World Cup. But inside are more timeless treasures, well preserved and definitely worth being better observed. 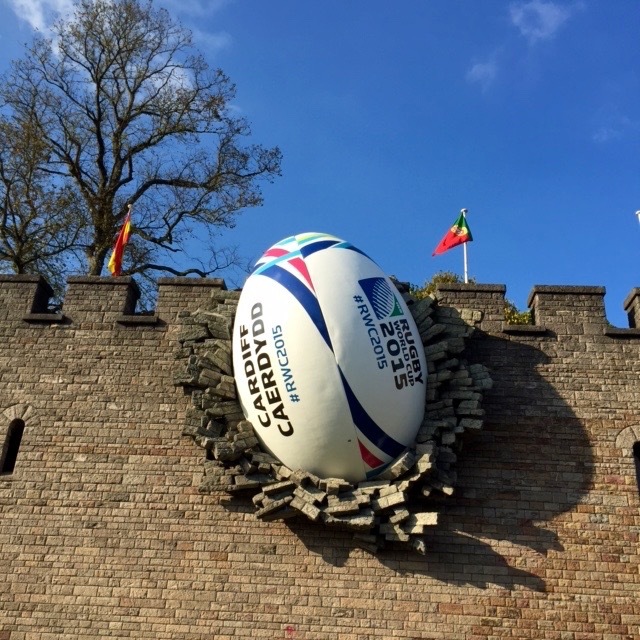 Even castles are not safe from ruggers with balls during the 2015 Rugby World Cup. Inside the gate, the most dramatic structure you see is that of the “keep,” the building primarily charged with keeping the castle defended from various marauders. Marauders, of course, sometimes get the best of the locals. And such was the case with the Normans who started having their filthy way with the English in 1066 and kept on keepin’ on, hitting Wales well into the 13th century. They’re the ones who concocted this keep, which, like many, sits atop a motte surrounded by a moat. The motte is a big hill often formed from the stuff dug up to make the moat (no water in this one now, only grass and wildflowers). We trekked up the keep’s steep steps to get a look inside (only bare, cold stone now) and outside, for a panoramic view of the city. The keep sits atop the motte overlooking the moat. The most lovely views here, though, were interiors — ones not created until much later, in the mid-1800s. The very wealthy third marquess of Bute commissioned William Burges to design an elaborate suite of “apartments” inside the main castle building. Beyond the plain stone exteriors, you enter fantastical rooms stuffed with elaborate carved furniture, murals and curious precious objects. Stained-glass windows cast shimmers of jewel-toned color all around. 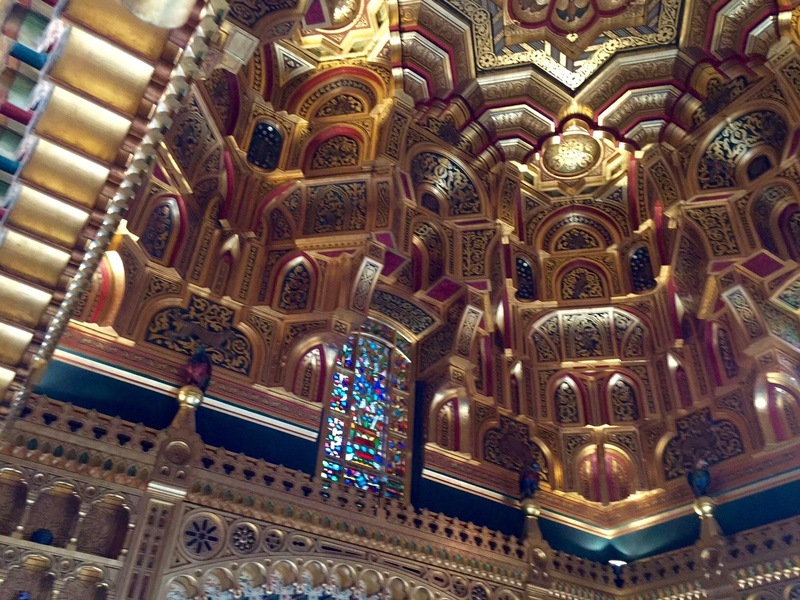 And above you hover intricate carved ceilings, several ornately painted and gilded to glowing perfection. It’s difficult to imagine the painstaking labors it took to create these marvels, but here they are, preserved for us to wonder at so many years later. Let’s hope people have the good sense, and means, to secure these delights for many more decades to come. The ceiling in this guest room, completed in 1881, is made of wood, decorated and covered in gold leaf. A crystal ball hangs in front of each stained-glass window to refract light into the arched ceiling.